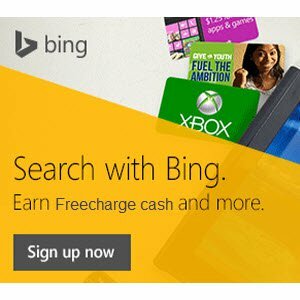 Hello Dealsnloot Readers,Get upto Rs 100 Freecharge Codes on using Bing Search Engine. Now earn credits while searching the Internet with Microsoft Bing. All you have to do is stay signed in to Bing Rewards as you search on your mobile or desktop. Freecharge is growing rapidly which is shown by its recent partnership with Bing Search engine. We know that you use Google mostly for your search related queries but its time to use Bing for at least for 10 searches daily if you want to earn freecharge freefund codes.So Grab This Loot Offer and Unlimited Freecharge Freefund Codes. 1) Firstly goto Bing Rewards Page from here. 2) Now if you have a Microsoft Account then Sign in or Create a new account. 3) After you get signed in, you will get 10 bonus credits. credit for every new search on Bing and you can earn 10 daily credits. 5) After collecting 90 credits, you can Redeem it for Rs 30 Freecharge Freefund Code or 210 credits for Rs 70 Freecharge Freefund Code. 7) Install & Open the FreeCharge App. Login/Sign up your Account on FreeCharge. 9) Enter your Amount and then click on “I have Freefund Code” >> Enter the Codes which you got and finally add money to your Freecharge Wallet.